A bunion is a progressive foot deformity that results from mechanical imbalance and undue stress on the big toe joint. This leads to a bony prominence to the inside or top of the toe joint and drifting of the great toe, causing crowding to the smaller toes. Contrary to popular belief, bunions are aggravated, not caused, by shoes. Bunions are usually an inherited deformity of the foot. Bunions more commonly affect women due to wearing high-heeled and pointed-toed shoes, which aggravate the condition. Symptoms include pain at the great toe joint, swelling, redness, corns, calluses, and difficulty wearing shoes. Because bunions are progressive, it is best to see a podiatrist for diagnosis and treatment to correct the problem before severe pain, arthritis, and deformity occur. A bunion is diagnosed by our podiatrists with physical examination and x-rays. Conservative (non-surgical) treatment includes padding, icing, anti-inflammatories, custom orthotics (shoe inserts), and accommodating shoe gear. Depending upon your symptoms, age, and activity, surgical correction of a bunion may be advised by your podiatrist. 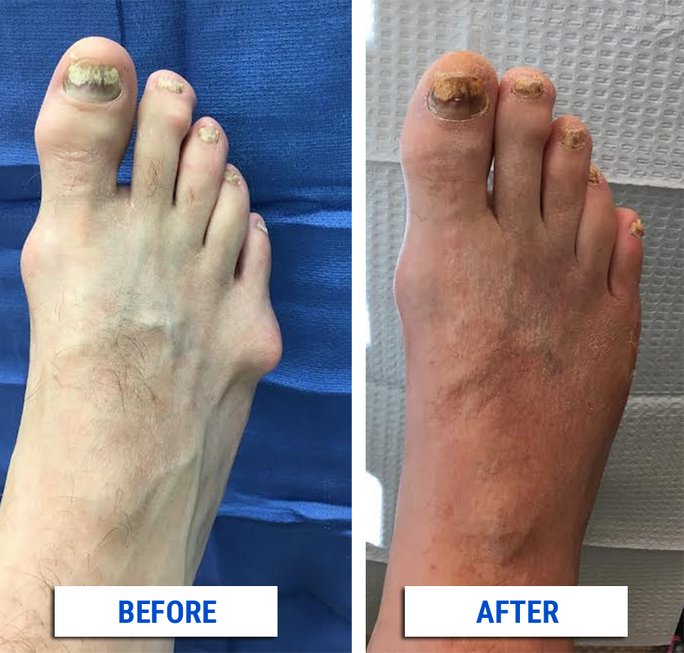 There are many different surgical procedures for bunion deformities. In our office, your podiatrist will review your x-rays with you and determine the best treatment option for your specific condition, life style, and goals. Bunion surgery is performed by your podiatrist at either a hospital or surgical center. Patients go home the same day and follow up in the office weekly or every other week for x-rays and evaluation. Most of our patients are placed in a cast to protect the foot during recovery for an average of four weeks.